I found this recipe in a Walgreen’s magazine ~ heart health & you. Since it sounded so good and we have plenty of kale I decide to fix it for Kenny this week. We thought it was delicious, I used oranges since Kenny can’t have grapefruit, I think it would be great either way. Hope you enjoy it as much as we did. 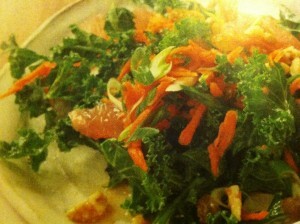 In a large bowl, toss together kale, carrots, raisins and green onions. Put the grapefruit or oranges on a cutting board. Using a sharp knife slice off the top and bottom of the fruit. Holding the knife blade horizontally, carefully cut downward, following the contour of the fruit, to remove the peel, the bitter white pith and the outer membrane(a little of the flesh will be removed, too). Holding the fruit over a medium bowl to catch any juice, cut between the membrane and the flesh of each segment to release the segment from the membrane. Discard any seeds. Add the fruit segments to the salad, toss gently. Squeeze the membrane and any peel with flesh into the medium bowl (you should get about 2 tablespoons of juice). Discard the membrane and peel. Whisk the remaining ingredients except the walnuts into the juice. Pour the dressing over the salad, toss gently to coat. Sprinkle with the walnuts.